The Golden Passport: Harvard Business School, the Limits of Capitalism, and the Moral Failure of the MBA Elite | Speaking of Jesus? 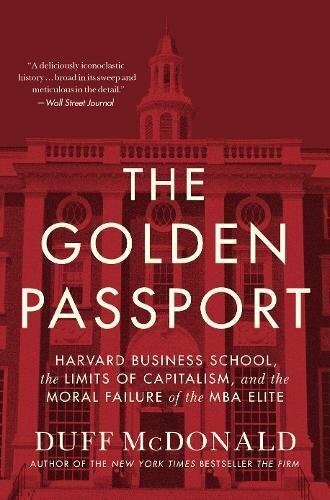 It took me longer than expected to read The Golden Passport: Harvard Business School, the Limits of Capitalism, and the Moral Failure of the MBA Elite – and not just because the book is so dang thick. It mostly took me longer because I found it so engaging and wanted to make sure I understood what he was saying. Duff’s account of Harvard Business School, it’s founding and place in the world is wonderfully told, well-researched and compelling. His writing is strong and calls HBS, it’s faculty, students, alumni and its related institutions to repent and truly live out their mission – to educate leaders who make a difference in the world. In the tradition of the prophet Amos or Jeremiah, he is relentless and plain old harsh at times. It’s not surprising, therefore, that The Golden Passport went over, as one faculty member told me, “like a lead balloon.” But another observed some weeks ago that the reaction on campus had been “surprisingly small.” Perhaps the Dean’s comments recorded in many places, including the Harvard Crimson, were just enough to neutralize the author’s substantial critiques before they could be heard and engaged. Besides declaring that HBS isn’t what Duff claims it is, I’ve heard and read little from the school that addresses the substance of his writing – his take on the history, his claims about the case method, the paucity of independent research, the illegal activity of some of high-flying alumni, and the propagation of dangerous ideas that contributed to bad behavior and economic collapse. The Golden Passport isn’t perfect but it could catalyze a conversation on campus that might be truly transformational. • Bring him to campus to speak? • Offer him a fellowship for the year? • Invite him to teach a course on the theory of the firm in the EC curriculum? Generous gestures like these might actually help us to engage his ideas substantially rather than just declare for the thousandth time that we are the leaders and move on. Duff writes a sweeping history of HBS with names, dates and lots of stories that were completely new to me. The whole tale is amazing AND it isn’t all pretty. But that’s how it goes, right? Every institution needs to own it’s, uh…, story – both the good and the bad – if it’s going to move forward well. To this end he describes the men like Edwin Gay (first Dean and the force behind the Case Method), Marvin Bower (McKinsey & Co. managing director), Michael Jensen (professor and propagator of “principal-agent theory” and “shareholder primacy” as the fundamental – if flawed – narrative for management purpose) and a host of others I would have recognized only because so many buildings on campus bear their names. Duff writes about their role in the HBS story and their ongoing influence today. • articulate a comprehensive and workable “theory of the firm. It made me wonder whether the school would be prepared to take such a step today in a similar crisis – or maybe a different one calling for living wages, clean water, safe communities and a sustainable economy for the United States or the Americas. Duff calls it like he sees it when he says plainly that the motivation for much if not all of what goes on at HBS can be explained by money: Cases, Publishing of the HBR, Executive Ed and HBX (HBS online learning). Of course each of these parts of the HBS project can be justified at least in part as self-supporting. The Golden Passport has some sections that seem to me needlessly harsh and personal. He sometimes crossed over from witty critique to outright disrespect in his comments. He takes aim at senior faculty like Rosabeth Moss Kanter, Bill George, Michael Porter, Nancy Khoen and Dean Nohria. He uses language that feels mean when he talks about the motives of students. In all these places, I get his point but it doesn’t help him make his case. For my part, both as a Harvard Chaplain and as a graduate student who crossed the river over 20 years ago to take classes at HBS, I’ve experienced profound generosity, kindness and sincere friendship from members of the HBS community. And this from those who disagreed with my theological, political, social and economic viewpoint. Describing the behavior of the faculty and students, pointing to the outcomes, and letting the reader contemplate their motives might elicit less defensiveness. To me this feels like a rather despairing comment. To discount the leadership role of managers sets aside their behavior in addressing the role of the firm in the economy. Maybe I’m biased, but managers who understood their role as leading organizations capable of addressing what Ron Heifetz at the Kennedy School calls “adaptive challenges” might be just what is needed to address the challenges of inequality. If the school is going to become the sort of place and the future MBA’s the sort of people that Duff is looking for, we must surely need a new sort of leader. • HOW TO TEACH ETHICS? • It is possible that Duff McDonald’s book will become a dog-eared reference for incoming MBAs for many years to come – the text is filled with references that students might find useful in “cracking cases” and might even alter the course of discussion in classrooms. But I’m mostly hoping that a few more people will read it and that doing so will give us all courage to push out the boundaries of the conversation on campus at Harvard. • A few weeks ago 2017 Class Day Student Speaker Andrew Cone told his graduating friends and the rest of those assembled on the lawn in front of Baker Library, “It is better to engage imperfectly than abstain indefinitely.” And this is my humble attempt – I’m hoping that others who know more and can say more will jump in – especially my student friends, faculty, and alumni from HBS. It’s not too late! And let’s get into the weeds and talk about the details. That’s what we’re here for. This entry was posted on Tuesday, August 1st, 2017 at 11:13 pm	and tagged with Duff McDonald, Golden Passport and posted in Uncategorized. You can follow any responses to this entry through the RSS 2.0 feed. Jeff: Thank you for your thoughtful review of the book and for your generous voice and influence at HBS. You have convinced me of the importance of Duff’s work; I’ve purchased my copy. Thanks John. I look forward to hearing what you think – especially how to move the conversation forward. Thanks for joining us Adele!